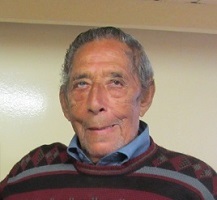 Obituary for Tristan da Cunha islander Ernest Repetto, who passed away 30th September 2018, aged 92. Ernest Louis Repetto, known to everyone as "Ernie", passed away on 30th September 2018 aged 92. Ernie was born on 20th April 1926, the third child of Arthur and Edith Repetto (née Swain) and had seven brothers and sisters. He married Daphne Swain on 22nd July 1957 and they had one son Clive who sadly passed away in April 1969 aged 10. Early in 1956, at the age of 29, Ernie and his friend Harold Green were chosen by John Heaney to join the Gough Island Scientific Survey (GISS). They both proved good friends and sturdy companions in the exploration of the island's rugged terrain and Ernie's boat-handling skills proved invaluable, enabling the surveyors to reach outlying islets and headlands. Always cheerful, deeply knowledgeable about island seas, weathers and nature, and willing to try almost anything (except seal meat), Ernie and Harold made a major contribution to the scientific success of the expedition. In 1968 Ernie and Daphne were kind hosts to Nigel Wace and Martin Holdgate on their return visit to Tristan and Gough. Returning to Tristan in 1963, after his family's evacuation to England in 1961 due to the volcanic eruption, Ernie left behind his parents and the majority of his family. Only his brother Michael returned with him to live on Tristan. Ernie was a generous and kind person with a strong personality. He was always willing to help others whenever he could. He loved going out fishing, both from factory boats and off the beach, working in the Potato Patches and travelling to Nightingale Island in his longboat "Margaret Rose". When he passed away, Ernie was the oldest man on the island. All who knew him will miss him, but he leaves behind many happy memories. Ernie's wife Daphne died a year ago, but he is survived by his sister Violet in the UK, and many nephews and nieces.